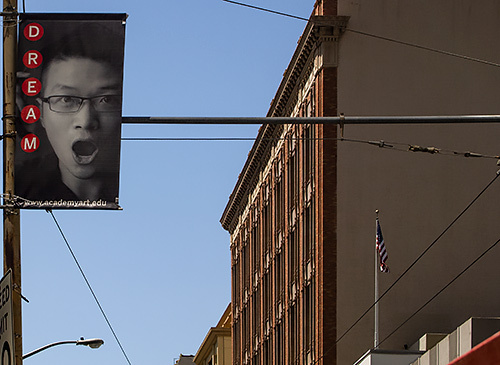 When we took this shot, we just wanted to grab that face on the poster flying high above the downtown traffic. But when we looked at it later, we saw all sorts of different things trying to get into the picture. Modern Composition. Micro Four Thirds at f8.0, 1/800 second and ISO 200 with a 40mm focal length (80mm equivalent). The shot we composed quickly on the street nearly centered the poster but not by choice. We were already almost at maximum zoom on the 14-42mm kit lens. It was as far as we could reach. Nothing particularly appealed to us about the composition. The usual clutter of any city shot to blame. Signs, poles, wires, parts of buildings -- all jutting into the shot, making graphic noise. But back at the bunker, where we do all our dreaming, we worked on the composition. The first thing we did was use perspective control to straighten the converging verticals. This is almost always a good idea but it really helped here. That let us crop out the poster on the left side explaining the one on the right. We just wanted that face, really, and the encouragement to dream. But how much of the rest of the image should we keep, we wondered. The flag, certainly. And that meant holding the building tops below it. Which kept the flag about a third in from the right side. And, if you linger on the image a minute, you'll see what's left of the speed limit sign in the bottom left. Suddenly we had a shot that told a story.